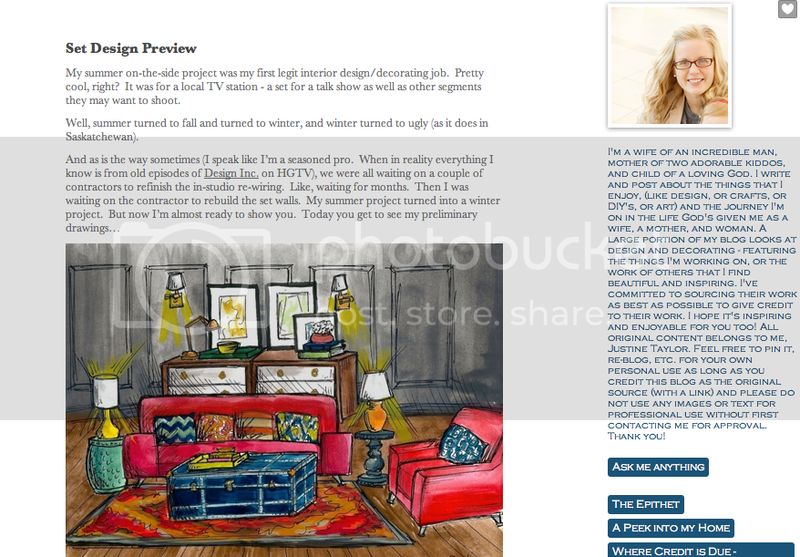 The other day, Amy commented on the cute little set that we film my TV show on (from this post). I meant to tell you about it. My friend Justine was the set designer. She's absolutely amazing at that kind of thing, and at all of the other kinds of things that she tries her hand at. Back in February (I think?) she posted her preliminary sketches, the process that went into translating the ideas in her head into a real, physical space, and the final pictures of the set. I thought the whole thing was fascinating, especially since I've gotten to play on the set and sit on the couches so much this year. You can read part I HERE, and part II HERE. Doesn't it make you want to be a set designer? What a sweet job. PS: Fun fact: some of the black and white pictures hanging on the wall were taken by Justine at my wedding! I didn't actually notice this until a couple weeks ago. Anyway. I thought that was, you know, "neat".